The scene itself needs no introduction. 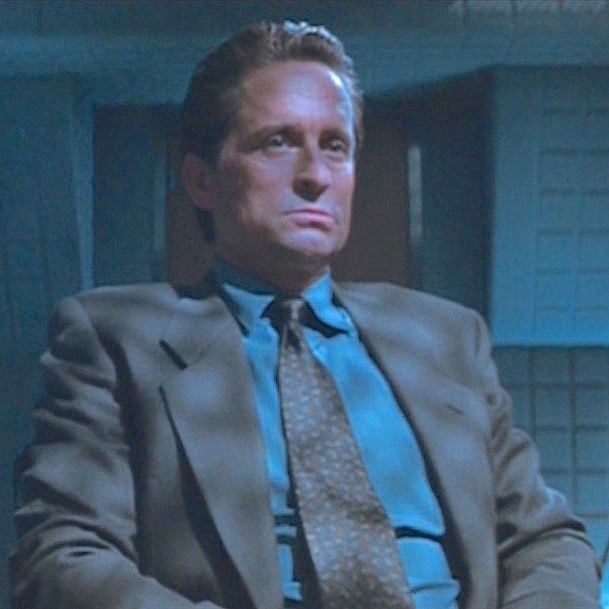 Nick Curran (Michael Douglas) sits in a shadowy interrogation room full of detectives (including Newman!) with Hitchcockian ice-cold blonde Catherine Trammell (Sharon Stone) facing them. In one of the most-paused moments of the VHS era, Catherine deftly uncrosses her legs just enough to guarantee that the room – and the audience – know that she neglected to wear underwear that day. If you haven’t seen the famous scene by now, you’ve almost certainly seen it parodied. In the spirit of Michael Douglas’ 74th birthday today, BAMF Style is taking a look at the fall-friendly office look he sports during this unforgettable scene. The scene has become so famous for what Sharon Stone isn’t wearing that viewers’ minds may need to be refreshed as to what other characters actually are wearing. 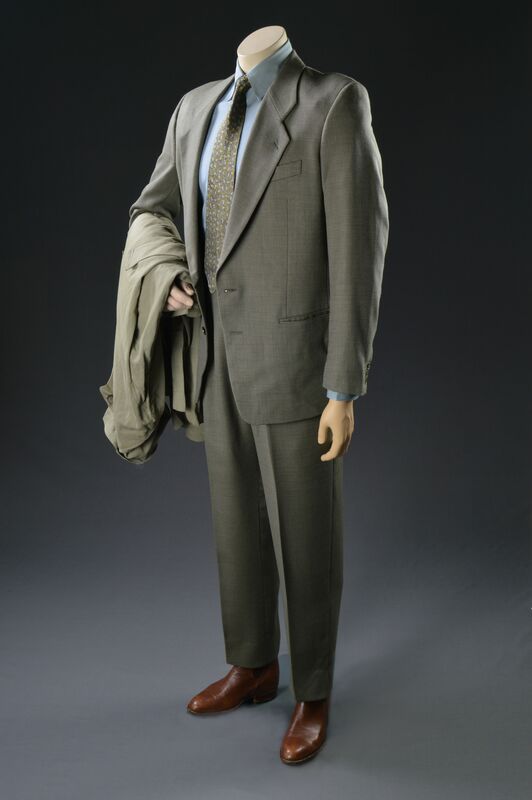 Michael Douglas’ fashionable cop once again dresses for the job in head-to-toe Cerruti, with a light brown suit made from worsted twill-weave wool. Nick Curran’s three contemporary suits, designed by Ellen Mirojnick, are all neutral tones, ranging from this warmer light brown suit to a cool light gray suit with a taupe suit falling somewhere in the middle. Ms. Mirojnick has frequently collaborated with Michael Douglas across his career, delivering some of his most iconic and influential looks in Fatal Attraction (1987), Wall Street (1988), and its sequel, Wall Street: Money Never Sleeps (2010), as well as Basic Instinct. Most recently, the designer has earned accolades for her work in The Greatest Showman (2017) and Cinemax period series The Knick. Nick’s light brown suit is fashionably styled for the early 1990s with its widely notched lapels, low two-button stance, jetted hip pockets, and ventless back, not to mention the overall cut. The jacket also has a welted breast pocket and three-button cuffs. Nick takes in the sights at Catherine’s home. After their resurgence in the 1980s, pleats remained popular for fashionable gents well into the following decade, and Douglas’ suit trousers in Basic Instinct are styled with double reverse pleats. The trousers have straight side pockets, jetted button-through back pockets, and plain-hemmed bottoms. Nick wears a dark brown leather belt with a steel single-prong buckle with his English tan stiff leather holster for his Glock service pistol snapped onto the right side of his belt. He keeps a matching leather pouch with a spare Glock magazine on the back left side of his belt. Shooter takes a coffee break. 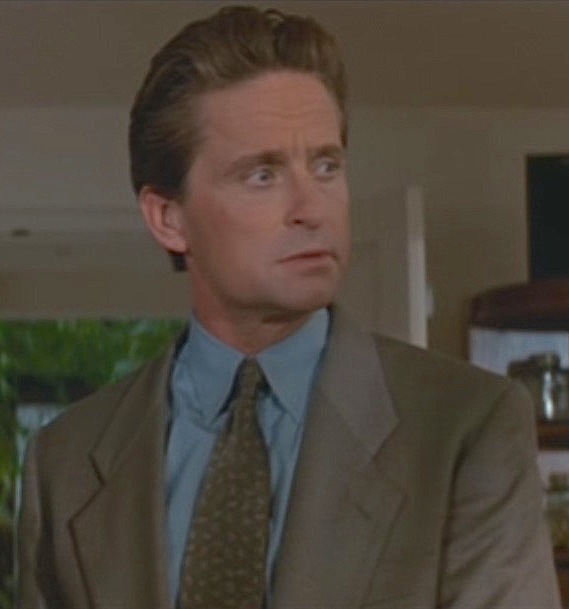 Anto of Beverly Hills custom made Michael Douglas’ shirts in Basic Instinct, using a high-quality end-on-end cotton. This sky blue silky-effect shirt is styled like his others with a point collar, plain front, button cuffs, and no pocket. Buttoned up at the office… and considerably loosened up after. The ’90s also saw a resurgence of bold ties with loud patterns and blades up to 4″ wide. Ellen Mirojnick wisely avoided these perilous trends and outfitted Nick Curran in neckwear just wide enough to be stylish in the ’90s and patterned with a relatively subdued print of gold and beige swirls on olive green silk. Nick Curran’s preference for Chelsea boots with his suits set him apart as a hipper, younger detective more tuned in to style than his conservatively dressed comrades. These slip-on boots with elastic side gussets are a similar English tan leather as his holster and magazine pouch, and he wears them with a pair of light brown socks that nicely coordinate with his suit. These guys are no match for Catherine Trammell. When Nick heads home with his off-and-on paramour Dr. Beth Garner (Jeanne Tripplehorn), the resulting scene reveals that he seems to prefer black boxer briefs. Nick Curran has had some issues with substance abuse in the past, but this episode is enough to send him back to the bar. “Double black Jack on the rocks,” is his order, implying a double pour of Jack Daniel’s Tennessee whiskey over ice… just what you’d expect from a cop on the edge. Nick Curran’s sleek on-duty suits benefit from a strong sense of balance, balancing ’90s trends with timeless fashion and balancing the neutral tones of his suit and tie with a bright blue shirt. A photo of the full costume – including shirt, tie, and boots – can be found here. You like playing games, don’t you? Ugh, your mention of those four-inch blades in the 90s gave me flashbacks. It was next to impossible to tie a knot that didn’t look like you were carting around a football under your chin. It was a relief when Mad Men made skinny ties popular again– here’s hoping they stick around this time.